We are delighted to be members of Your Holiday Matters - an independent assurance of quality. Membership can not be bought, and is only awarded to owners who demonstrate that they really care about providing a consistently high level of customer service and accommodation. 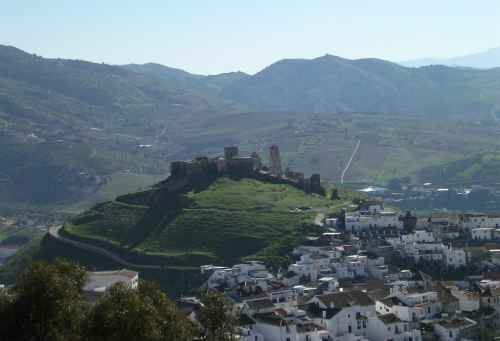 A fascinating Andalucian town with a wealth of history (more about history) Álora is a dramatic small town surrounded by mountains and set astride three steep hills, the most prominent dominated by an old Moorish Castle (above - the house is behind the castle). For the most part Álora is still a pueblo blanco (white-walled village) with narrow whitewashed streets, steep slopes, churches, lemon trees and squares where people gather. However, it also has a more modern quarter with reasonable and interesting shops and many bars and restaurants. This very Spanish town is deep in the heart of Andalucia but only 30 minutes by road from Malaga airport, so very convenient for travel from the UK. The neighboring countryside is also wonderful, a fertile valley (Valle del Sol) dominated by the dramatic mountains of two natural parks, El Chorro and El Torcal. It's perfect for walking, cycling and many other activities or, if you prefer, simply wandering around sightseeing. The region has many areas of outstanding natural beauty, villages and towns to explore and sites of historic interest and importance to visit. We hope you come, you'll love it!